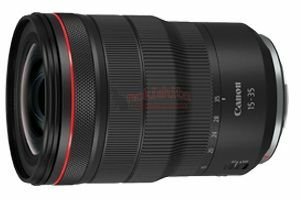 Keith’s assorted information and links for Canon’s EF lenses and rumours about new ones such as the RF lens range. He’s written numerous articles and reviews covering lenses and photography related issues if you’re after something rumour free. Please use your own judgement when reading the speculation, and remember that rumours are for entertainment as much as anything else! 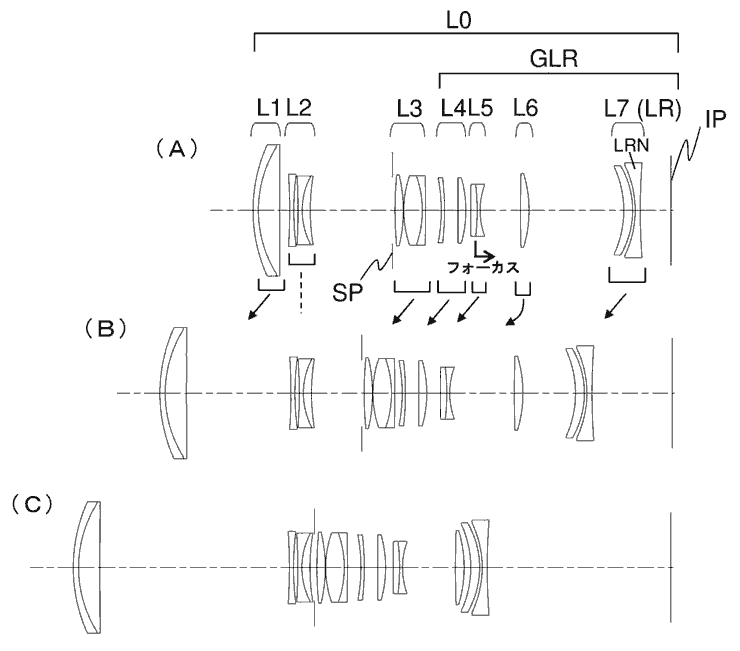 AA: EF lenses have eight contacts on the lens mount, while RF lenses have 12. What sort of additional features does this offer? MB: The whole communication system in the RF mount has been designed with future potential as one of its core requirements. When we introduced the EF mount there were so many things we weren’t aware of; IS was still a dream; we didn’t even know what digital was. When we were designing the RF mount, the future is also unknown, so we needed to plan ahead. Some of the contacts on the RF mount we’re not actually using today. They’re for future expansion. 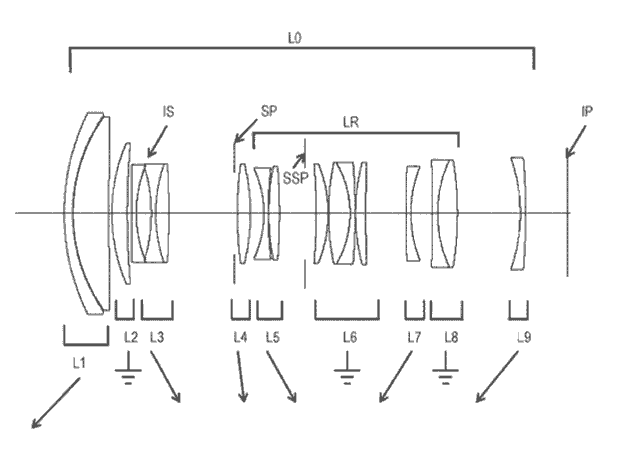 But there’s a higher-powered delivery system, so we can deliver more power to the lenses, which could mean a bigger motor for faster autofocus (AF), or a power zoom. All these things are being built into the interface from day one, to allow for expansion. What that expansion is we don’t know. We’ve still got to work out what the next 30 years hold for us. The important thing is to lay down a solid foundation so that we can adapt to future demands. 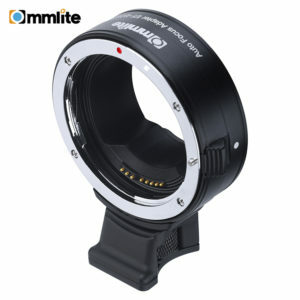 The mount size – 54mm – just happens to be the same size as the EF mount, but we did try other mount sizes. We built prototypes and tried lots of crazy things to see what would happen. But 54mm gave the best balance, allowing us to position the optics any way we want. 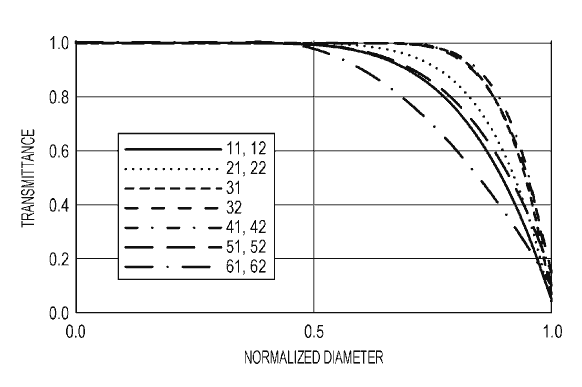 So then the question is, why a flange distance of 20mm? Slightly smaller would have given better possibilities optically, but that means the whole front panel becomes thinner. You have to make the camera thinner and smaller, therefore the front body has less strength, and because you have to use thinner metals, the screws that hold it in have to be thinner. All these things then affect durability and endurance. And if you want to hang a big lens off the front of it, you’ve got to have a solid front panel, with big screws that keep everything in place. So it’s that balance of endurance and durability versus optical performance. We’ve got the EOS M, which has a flange distance of 18mm and a smaller mount – so we had an example of a smaller mount and a shallow body depth. 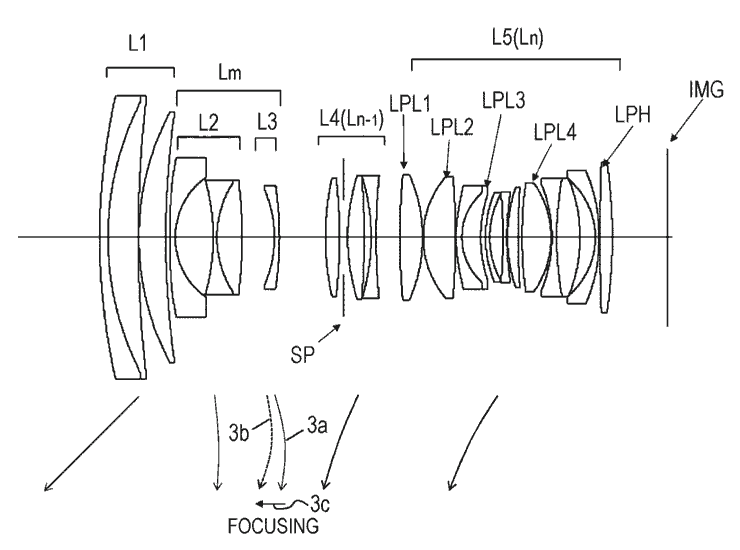 We had this as a reference point and tried different lens designs to see what would happen. It was a bottleneck for the future. 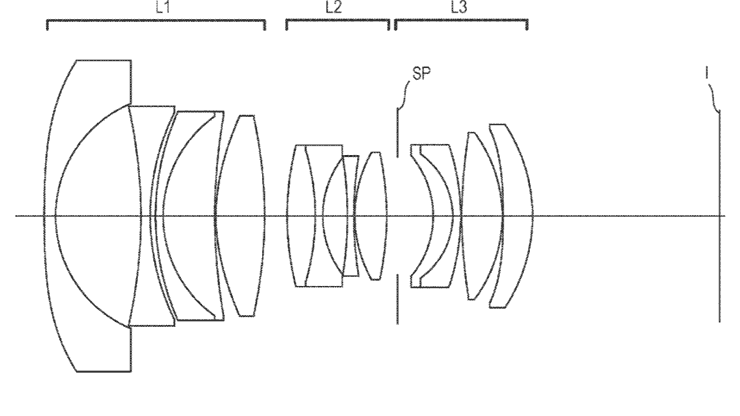 If we wanted to use very wide aperture lenses, etc., they weren’t going to be possible on that sort of mount. AA: There are currently four RF lenses, with a further six recently announced, but let’s not forget that the EOS R-series cameras are compatible with Canon’s range of over 160 EF and EF-S lenses. Are there any differences in terms of performance when using EF and EF-S lenses on EOS R cameras? MB: No. For the RF protocol there are different channels. One is for the lens to talk straight to the camera, so if you’re zooming, etc, they’re communicating. And then the mount adaptor has a different channel, so it doesn’t interfere with any signals. 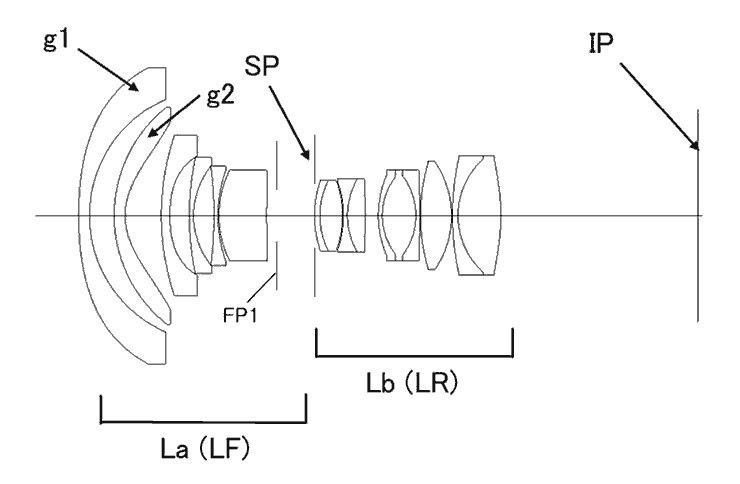 Once the camera detects an EF lens, it swaps its protocol from RF to EF. It’s actually using the same protocol as an EOS 5D Mark IV with the same lens. 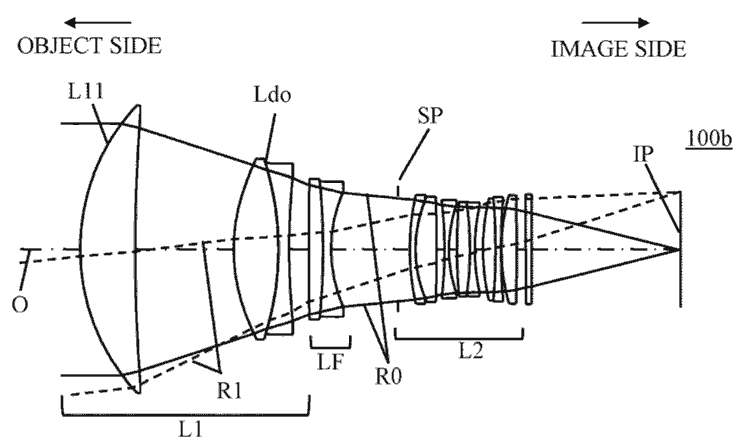 7th An interesting interview (from CP+) at [DPR] from Sigma mainly about lens development. 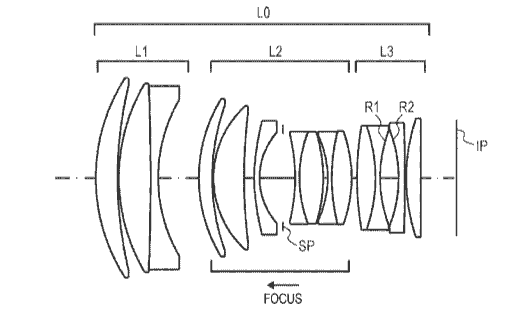 In particular there are all the different design constraints from differing lens mounts and AF needs. 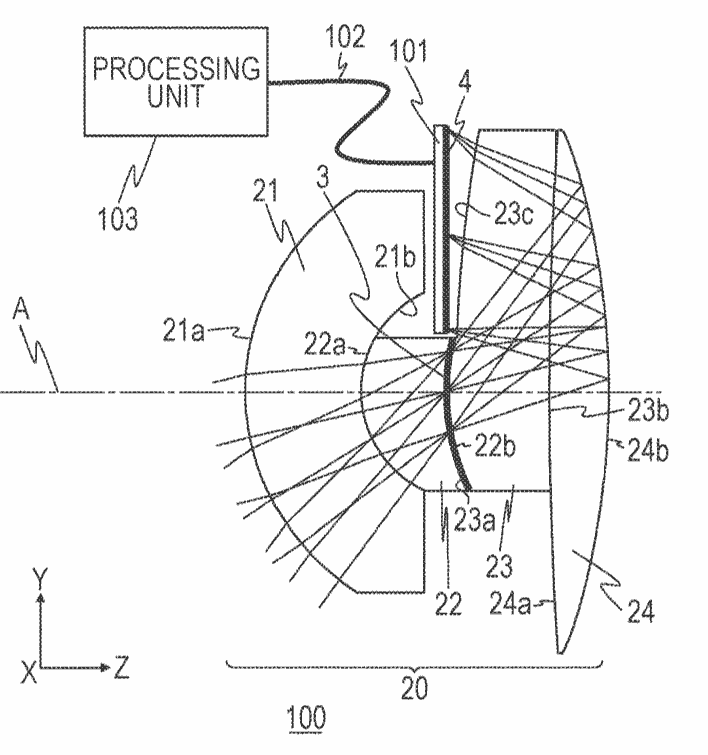 4th New prime lens designs in two US patent applications. All are full frame with slightly shorter than EF back focus distances. 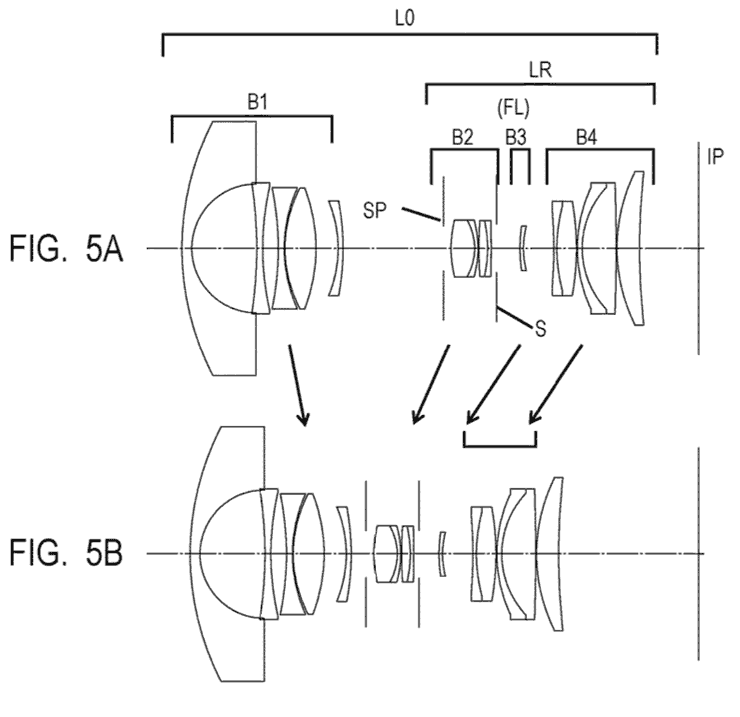 However the retrofocus designs look more likely as cine lenses than RF primes. 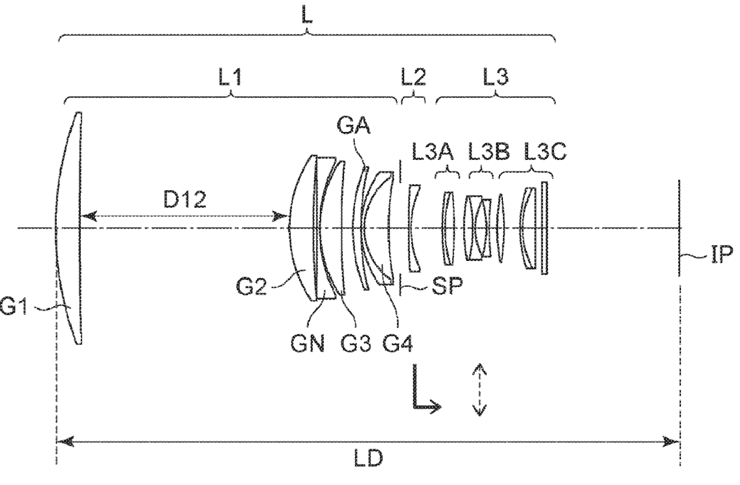 30th An interesting Nikon interview [IR] looks at lens and camera design advantages of the Z mount. This seems to be the Japanese version of the US application [USPTO] mentioned here a while ago. 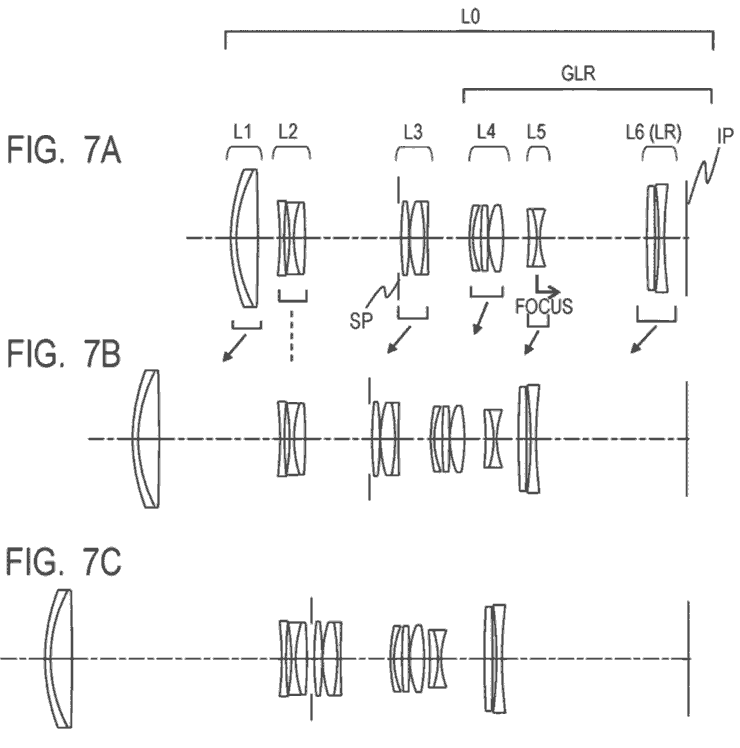 A set of designs for long IS lenses appears in a new Canon patent application [USPTO]. Back focus distances are all enough for EF or RF designs. These are actual averaged sets of data for good numbers of sample lenses (I look forward to seeing the TS-E lenses later). 22nd In one of those things I noticed when using wider lenses at wide apertures on the EOS RP(EF50/1.4 and Zuiko 50/1.2), is the return of ‘proper DOF’ in the viewfinder. With exposure adjustment (Av mode for the 50/1.2 and auto ISO) you can get a very good feel for the real DOF that you’re going to get. This not only encourages more thought about the areas in focus, but also how the OOF background looks. I had special focus screens on the 1Ds/1Ds3 and missed this on the 5Ds. 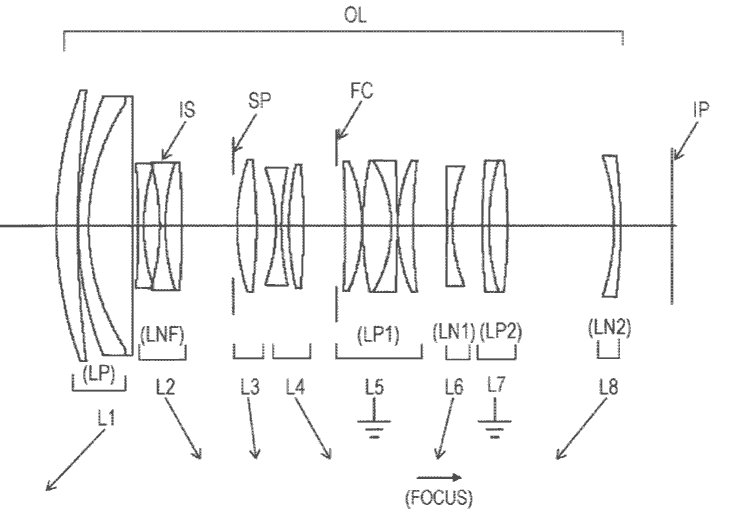 This firmware allows compatibility with Canon’s in-camera Lens Aberration Correction function to enable correction matching the optical characteristics of each lens. It also corrects the phenomenon that abnormal images appear or operation errors occur when the function is enabled. In addition, it improves the functionality. 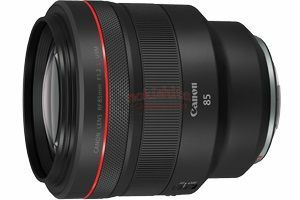 Furthermore, there is an improvement to the phenomena particular to some lenses when they are used in combination with the Canon “EOS R” and their “Mount Adapter EF-EOS R”, or “Control Ring Mount Adapter EF-EOS R”. Compatibility is a big issue at the moment for third party adapters and lenses. 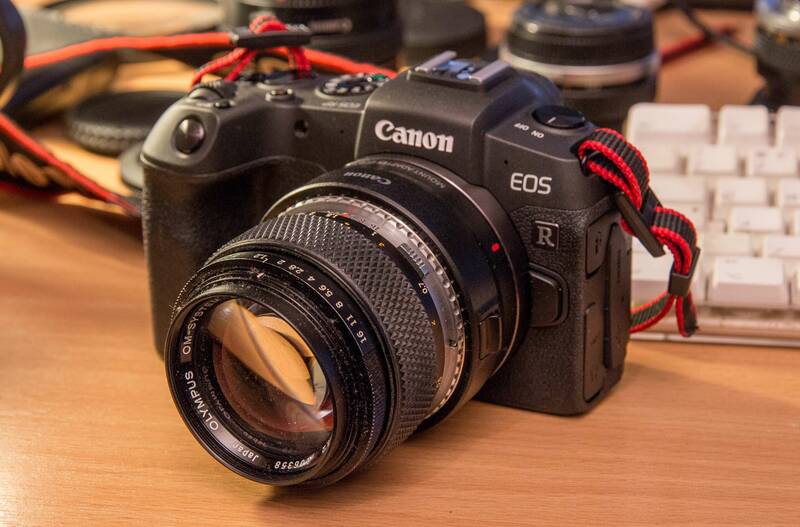 I’ve had to remove the AF confirm chips from my M42 and OM adapters since they locked up my EOS RP. I’m testing a brand new 2x macro lens at the moment, but it works just fine on my 5Ds. Also a 100/1.4 – once again all RF full frame. 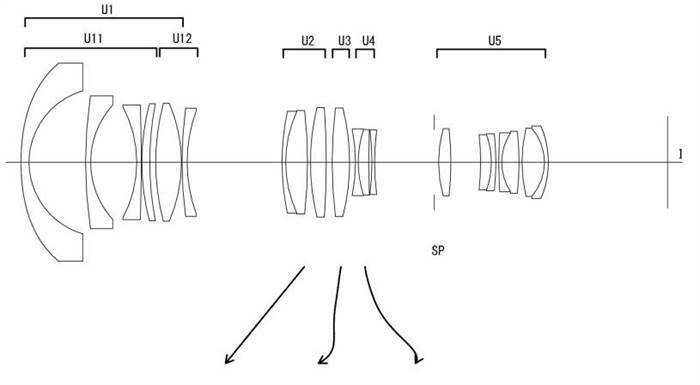 Well, obviously different mount designs let you develop lenses with different maximum apertures, and some at Sony seem peeved by comments that the Sony E mount wasn’t designed for mirrorless full frame [PR]. 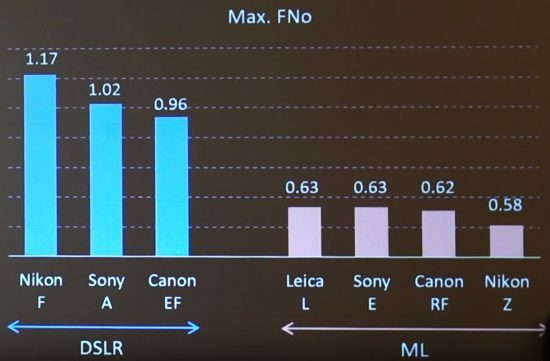 This slide [NR] appeared at a Sony presentation, showing how low the F number could go for mounts. These figures are from a Sony presentation, so I’ve no proof of this or what design constraints and caveats there are behind those numbers. 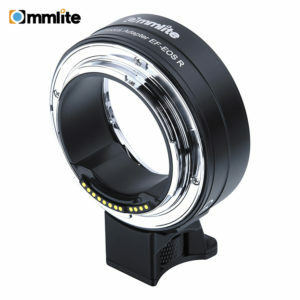 Looking at the E mount, it’s apparent that you ‘can’ do full frame – that is not to say it was designed ‘for’ full frame. 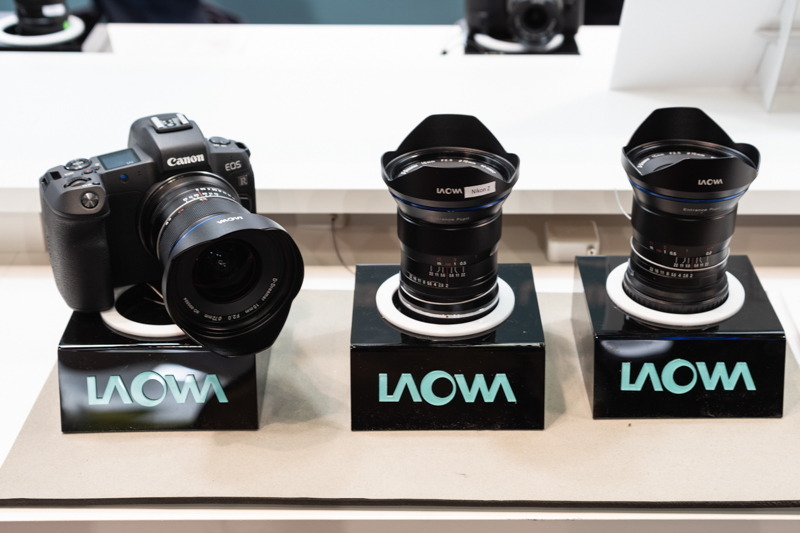 The article includes a note that the Laowa 15 mm F 2 Zero-D and Laowa 10-18 mm F 4.5-5.6 Zoom are coming to Z and RF mounts. There’s a big rush to get lenses out that go with the RF mount, and Canon have suggested several. 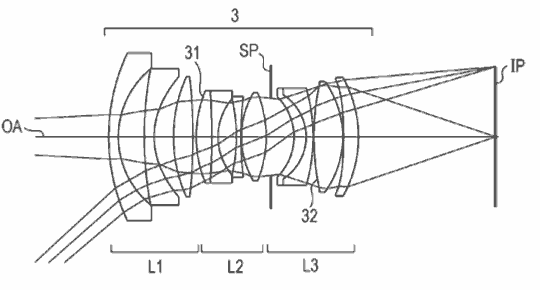 There are also the more extreme, such as RF14-21 F1.4 [CR] – partly based on some patent application stuff we’ve seen here (RF 16-35mm f/2.8L and an RF 12-20mm f/2L). 3rd Whilst I’ll be writing more detailed articles using the EOS RP, I’ve a Using the EOS RP notes page where I’m jotting down thoughts about using it, from the point of a long time full frame Canon DSLR user. Mostly good and I’ve only a few gripes at the moment – a particular annoyance being that it turns on lens IS for as long as the viewfinder is active, rather than starting it as you half press the shutter. This is a pain with bigger lenses, not only does it waste the (tiny) battery power, it means that IS is on for a while when I’m just carrying the camera. Please Canon, a C.Fn function to only turn on IS when you want it? 1st Our RP has turned up and I tried a few old lenses on it with adapters – a quick note that if your adapters have ‘AF chips’ on them, they may lock up the camera. Other than that, I’m pleased to see how useful my old glass will be. 28th I’ve been trying some new camera shake removal software from Topaz, not at all bad, and it has a free demo versio. 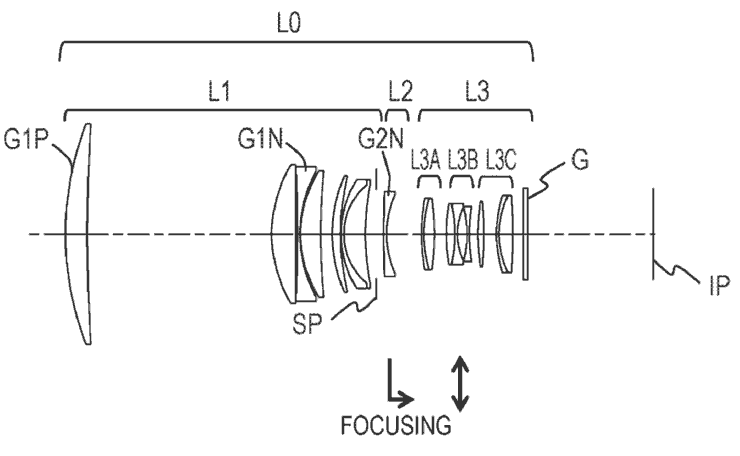 Will the next Tilt Shift lenses from Canon finally incorporate tilt/shift settings in camera data? 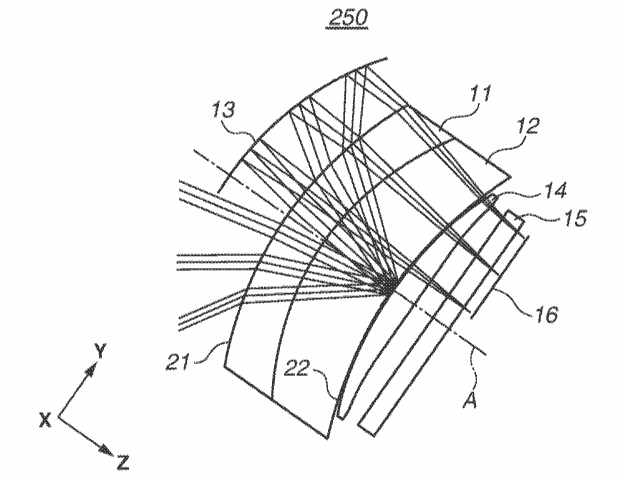 A new patent application [USPTO] discusses image aberration correction when the lens is tilted/shifted. 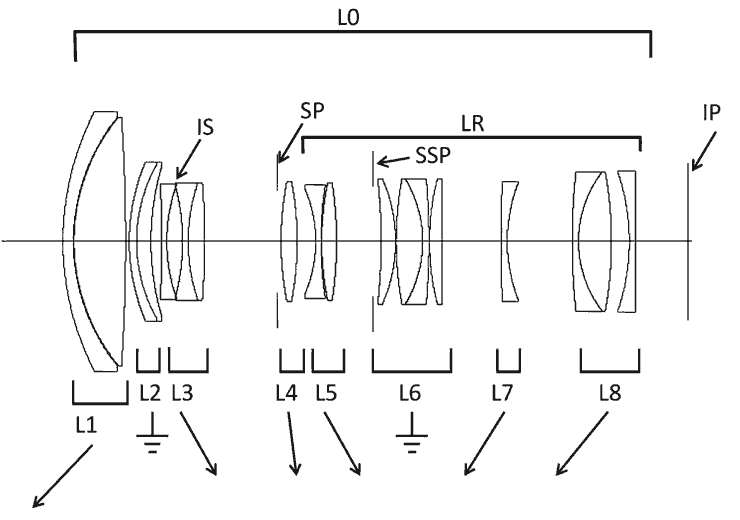 At last – lens movement data in the EXIF? 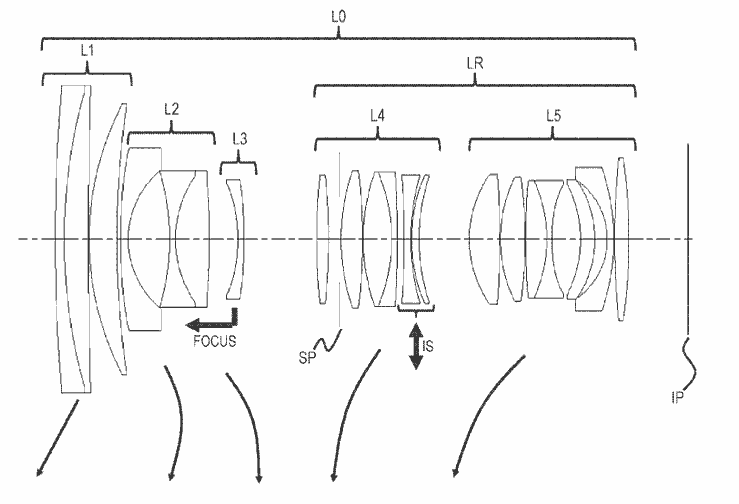 Note how much more symmetrical this design is and how it has internal elements that do not move relative to the lens when zooming and focusing. Some non-‘L’ RF zooms? Could this be the RF 85/1.2L USM DS recently mentioned? 400/4, 600/4 and 800/5.6 designs a bit different from previous ones. 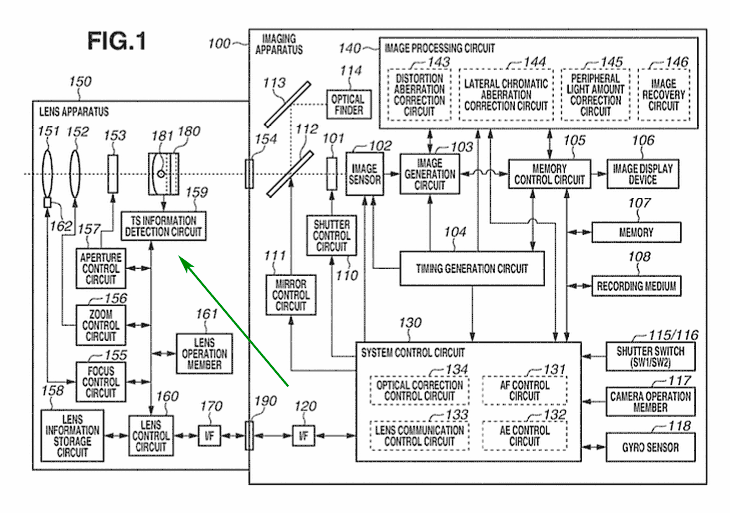 Remember that patents only usually show some aspects of designs rather than complete products. 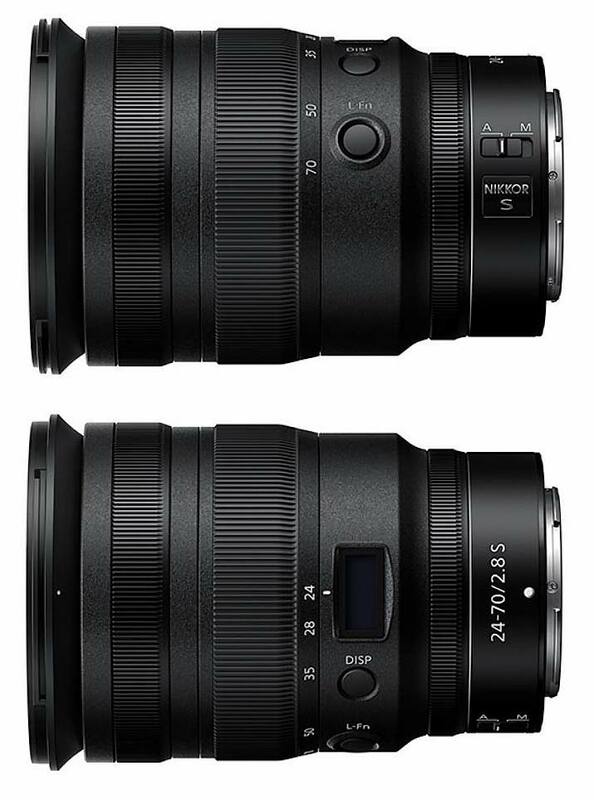 20th Tamron announce three new lenses SP 35mm F1.4, 35-150mm F2.8-4 and E-mount 17-28mm F2.8 III. All three are full frame, however it’s worth noting that the first two are Canon EF and Nikon F mount, whilst the mirrorless one is Sony E mount only. I suspect we’ll see version for Z and RF mount before too long. 17th Whilst not mentioned in the recent lens list, a RF50/1.8 and RF24/1.4L are suggested as possible additional lenses [CR] – both seem pretty obvious additions to expand the range at some point. 16th There appears to be renewed interest in apodisation[WP], with respect to the RF 85/1.2L USM DS recently pre-announced. This is something Canon have worked on a lot. DE: Is this something like an apodization lens? 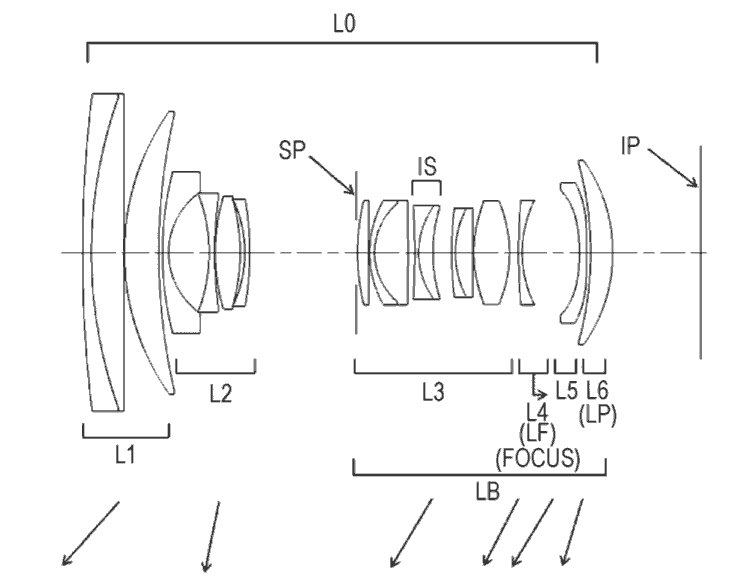 Can you share any more detail about what the lens is like internally? Canon: Yes. It uses basically the same technology as apodization. There are several manufacturers that have apodization lenses, but our approach to apodization is slightly different. What we do is we use coating technology to make the apodization. A recent patent application [USPTO] shows how variations in coatings can give light transmission that varies across the element. This is the 24/1.4 with apo elements ’31’ and ’32’. Here’s the accompanying press release. 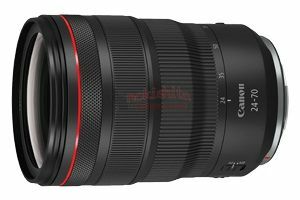 United Kingdom, Republic of Ireland, 14 February 2019 – Canon, the world leader in lens manufacturing, today reaffirms its commitment to its recently launched EOS R System and RF Mount, announcing the development of six full frame lenses for release in 2019 in celebration of reaching a production milestone of 140 million EF and RF lenses[i]. Redefining the possibilities of photography and videography, Canon?s innovative EOS R System and existing RF portfolio of lenses provides the tools for users to enhance their skills and shoot creatively, without limitations. Built from the ground up, the EOS R System and RF Mount takes the heritage of the existing EOS System to new heights. Developed in line with technological advancements and end user feedback, Canon’s development of EOS anticipates the future technical and creative needs of photographers and videographers. The EOS R System incorporates the best of EOS, with even greater levels of performance, lens design possibilities and creative flexibility. Launched in September 2018, the RF lens mount enables a radical new optical design, allowing large lens elements to be placed as near to the sensor as possible, allowing light to hit the sensor straight on. The RF Mount enhances communication and power transmission between the lens and camera body, as well as helping to achieve the world’s fastest autofocus speed for a full frame mirrorless camera system[ii]. 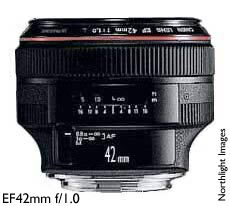 The mount’s short back focus and wide 54mm mount diameter has made it possible for Canon optical engineers to have a new degree of freedom in order to create a new generation of optics – it provides an ideal balance between reducing the size of the system, high-quality images and high-spec performance. When developing the EOS R System, Canon’s engineers considered the ease of handling and potential to expand the lens portfolio in the future. This new line-up of lenses provides shooting options for all users of the EOS R System, whatever their requirements – from stills and movies, to landscapes or weddings. 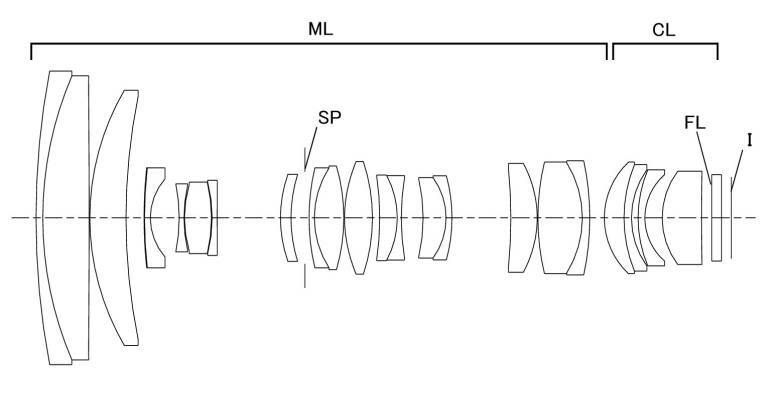 Six full frame RF lenses are currently in development, suiting the needs of every user from advanced amateurs, to professional photographers and videographers, all in pursuit of the perfect shot. 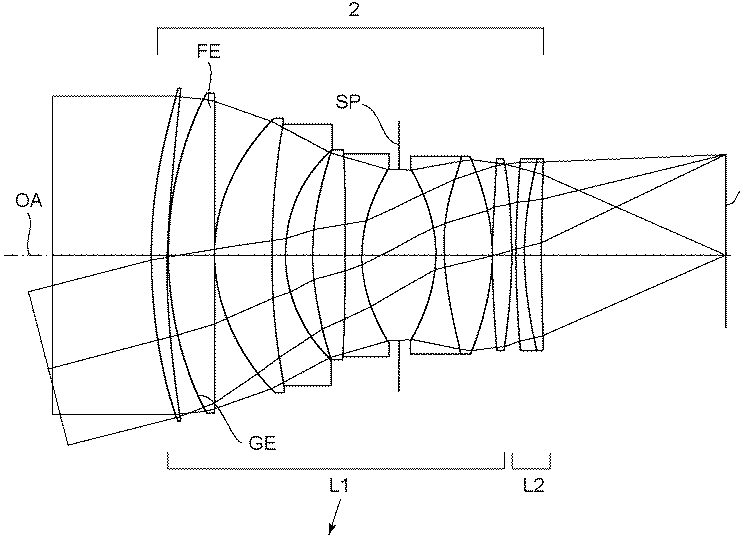 Building on Canon?s optical lens heritage, this range of lenses will push forward the frontiers of creative capture thanks to the new, cutting-edge optics and advanced image processing for both stills and video. Further expanding the EOS R System, Canon today also launches the EOS RP – ideal for those looking to take a step-up from Canon’s APS-C models into Canon’s full frame world. It is compact, lightweight and versatile. Ideal for travel, landscape and portrait photography and videography, the EOS RP opens up the full spectrum of benefits of the EOS R System – including the world’s fastest autofocus – and as Canon’s smallest, lightest[iii] full frame digital camera to date it provides the ultimate blend of practicality and ease of use, with impressive image quality. Promising greater potential, advanced amateur photographers and videographers can use the EOS RP to enhance their technical skills and explore their creativity. Additionally, three lens mount adapters allow more than 70 current EF and EF-S lenses to be used with the EOS RP and the innovative EOS R System, adding new functionality to existing optics, while maintaining the excellent levels of performance and functionality previously seen with EOS DSLRs. For more information about the EOS R System and Canon?s commitment to the RF Mount, please visit https://www.canon.co.uk/cameras/eos-r-system/ . 13th The Nikon Z 24-70mm F2.8 S lens is due soon. 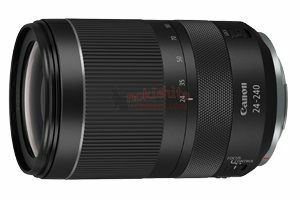 There may well be RF85mm F1.2L USM DS and a RF85mm F1.2L USM versions. 11th Samyang are widely expected to be expanding their range of AF lenses for EF mount. At the moment they just have 14mm and 85mm with AF. 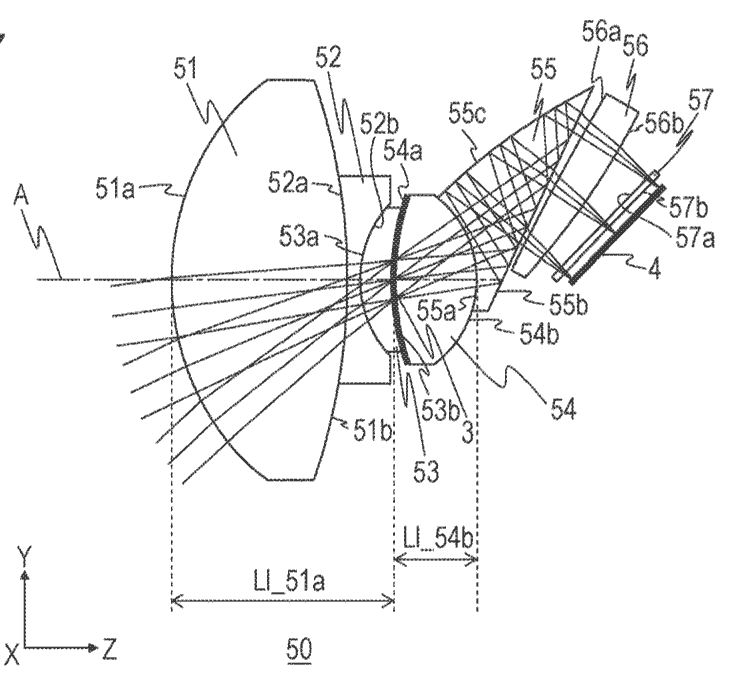 Canon continue to address performance issues for diffractive elements for lenses, and their manufacture in a new patent application [USPTO]. The DO element includes resin layers of differing optical characteristics. 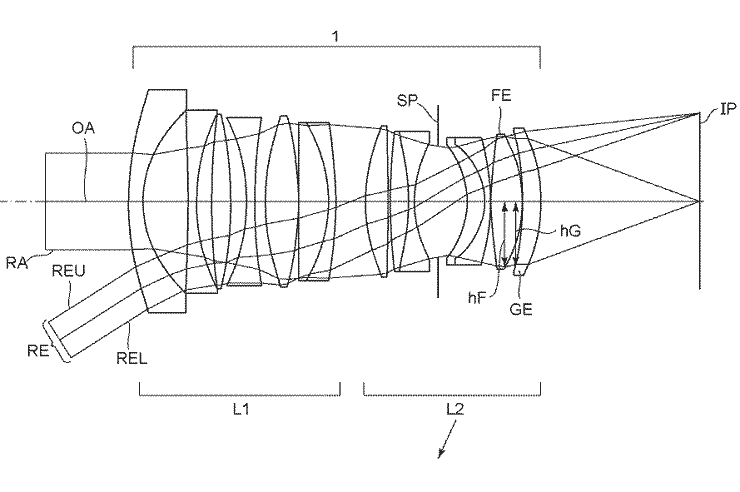 29th Canon has published a lengthy Developers’ Interview for the EF 400mm f/2.8L IS III USM & EF 600mm f/4L IS III USM Lenses [PDF, 19.6 MB]. 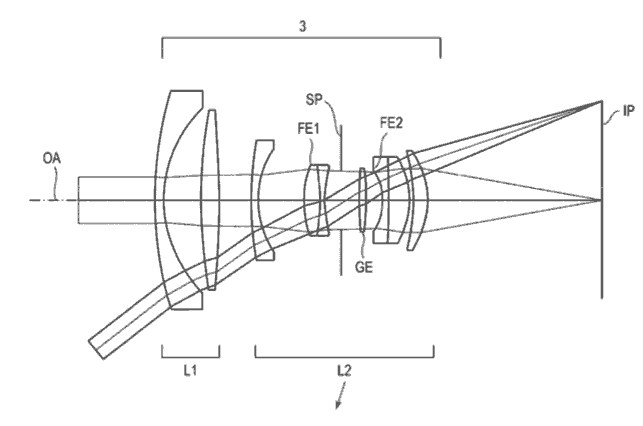 24th A Canon US patent application [USPTO] looks at zoom lens designs using exotic glass. Short back focus, so RF full frame. If you look back on this page (and the archives from previous years) you’ll see lots of DO related patent info. Diffractive optics designs still suffer from light leakage, and quite a lot of work has gone into reducing this. 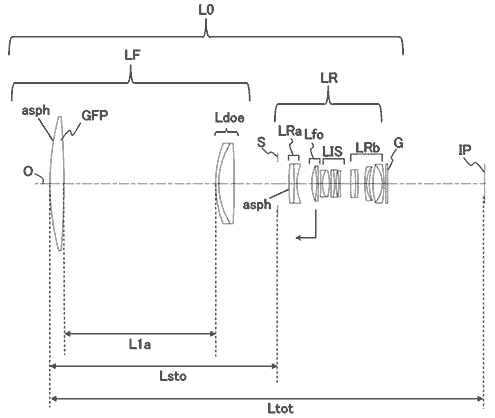 Where a normal lens bends all the light that isn’t reflected off surfaces, DO elements can ‘leak’ undiffracted (‘zeroth order’) light through, reducing contrast and producing some of the halo effects associated with early DO lenses. 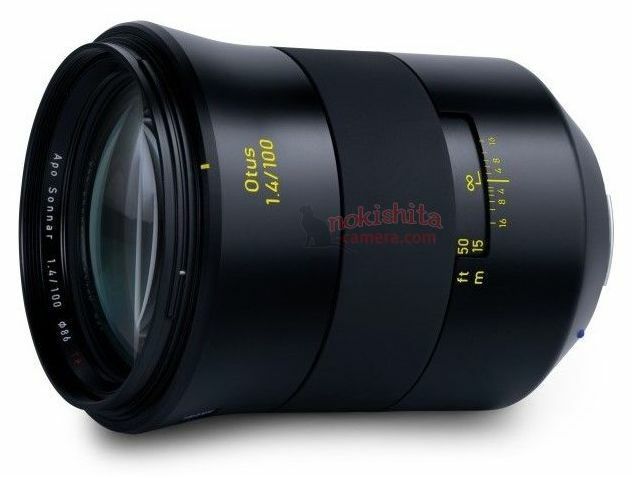 17th Sigma have updated their compatibility info for their lenses with the EOS-R.
All full frame and short back focus. 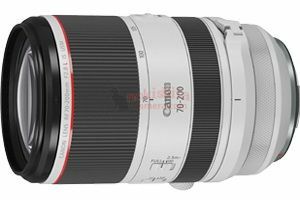 28-70 f/2 and 24-70 f/2.8 are in the sample specs. 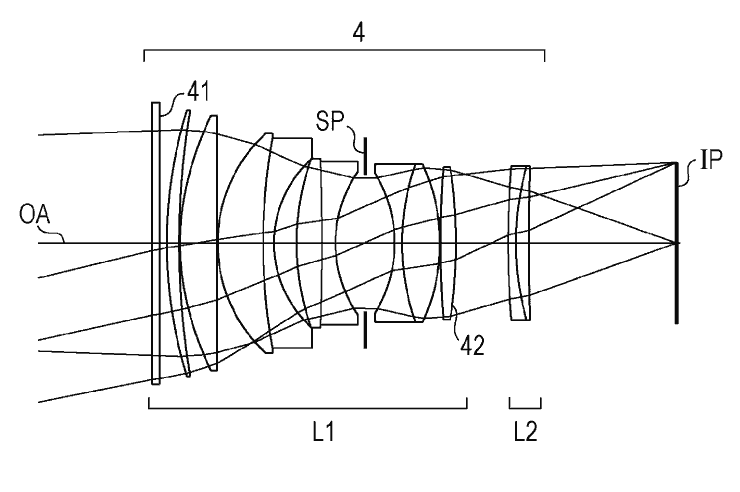 Possible RF 24-70 f/2.8 lens design – a lot of glass. Intended for sensors and projectors. 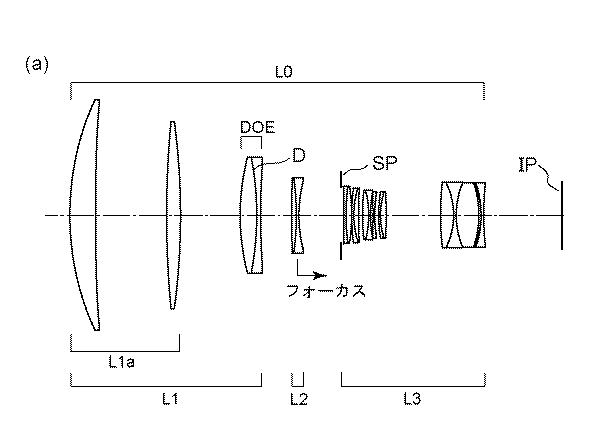 A Japanese lens patent application by Canon [via HL] shows various lens designs with additional focal reducers. 5th A new basic EF->RF adapter is available from Commlite. It’s a metal one with detachable foot and supports full lens/body communications. 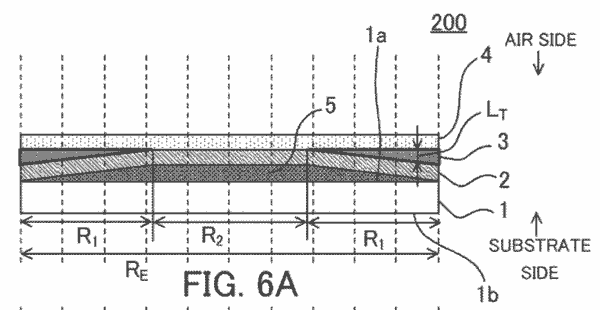 APS-C isn’t forgotten with some smaller zooms [USPTO] where the designs concentrate on the rear elements and achieving good telecentricity. 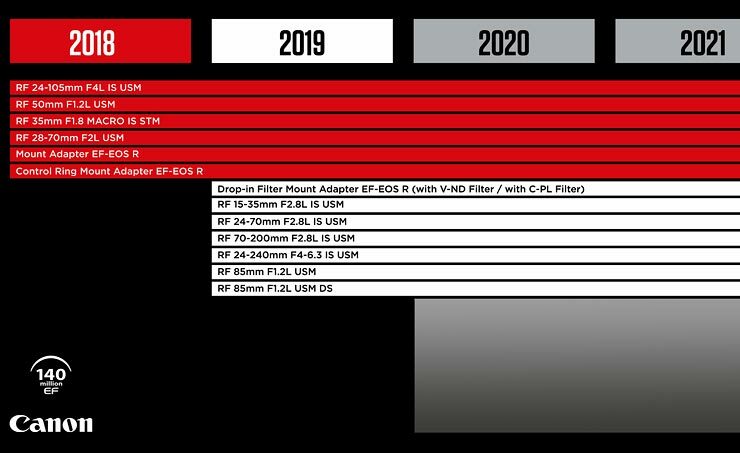 January 2nd 2019 We’re all expecting Canon to make a serious expansion effort for the EOS-R range and RF lenses this year.